The trail leaves Rohn and crosses the South Fork of the Kuskokwim River and turns sharply left (inland) about 3/4 mile below the Rohn checkpoint. From here to Farewell Lake the trail crosses sharp hills with moderate and steep grades, both up and down. Some of the grades are up to 1/2 – 1 3/4 miles long. The trail is very narrow in places and in some of the denser stands of spruce is a tunnel. The worst area is the Tin Creek with a steep side hill drop to the canyon floor and a climb up the other side. This climb is to the right of the gorge (100-150 yards) and should be well marked. The trail from Tin Creek to Farewell Lake continues through spruce and alder. In the open areas the trail is but a rut when the snow is light. It crosses several “wallows” which are very rough. Approaching Farewell Lake the terrain levels out somewhat and crosses a small lake a couple of miles prior to dropping onto Farewell. This is bison (buffalo) country! The trail leaves Farewell Lake at the northwest end of the lake and for the next 8-10 miles passes through dense spruce forest and across lakes. It then enters the old “Farewell Burn.” In the summer of 1984, the B.L.M. cleared the trail through the Burn. It is 25′ wide and was cleared to bare ground so there are no windfalls and it is a good trail. The terrain is rolling with short moderate grades. This trail segment is approximately 20 miles long and it then enters very large open swamps to the Salmon River. Trail markings are the only visual references for direction. At the Salmon River the trail turns to the right, crosses the Salmon River at the cabins and continues to Nikolai through spruce and alder stands and open swamps. It crosses the Kuskokwim River into Nikolai. The one danger area through the Burn is at Bear Creek, which has a history of being open. Bridges will be built, if needed, and the area will be well marked. 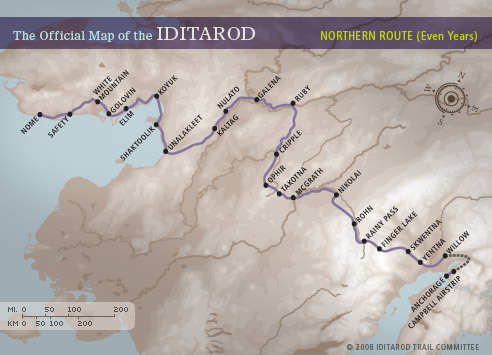 Nikolai (NIK-o-lye) — (NIK) Lat 63.02 Long 154.22 — Population 101 — This is the first of many Native villages along the Iditarod Trail. There is a village store at the far end of town across the airstrip, and limited lodging is available through advance booking. The checkpoint is located in the Community Hall.